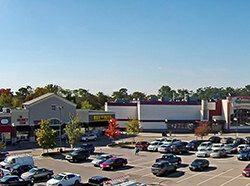 The 10-theater Marquee Cinemas, Jersey Mike's, and Walgreens Pharmacy are three of the big attractions at The Orchards at Dover Shopping Plaza, situated on the westbound side of Route 37 at St. Catherine Boulevard, approximately three miles from downtown Toms River and five miles below Lakehurst. Other draws to this Ocean County center include Ruby Tuesdays, Saladworks, Five Guys, the award-winning Good Fortune Buffet and Grill, YoFactor, Buy-Rite Liquors, Model Nails, Hair Friends and Company, The Regency Memory Care Club, and more. Developed from the ground up by Florham Realty, the Orchards at Dover occupies almost 100,000 square feet of space devoted to entertainment, restaurants, and a variety of services. The Orchards at Dover draws customers from Brick, Manchester, Pleasant Plains, Beachwood, and the Jersey Shore area around Toms River. More than 200,000 people live within a seven-mile radius of the busy shopping plaza. We currently have one space available at this location. Download our complete marketing guide for Orchards at Dover here. If you are interested in this location: Download our complete marketing guide for The Orchards At Dover by clicking the link below.